Summary: Alex Sherman-Zicklin is a midlevel marketing executive in L.A. whose wife Figgy’s fourteenth TV pilot attempt becomes a huge Emmy-winning hit. Overnight, she’s sucked into a mad show-business vortex, and Alex quits his job to become the family’s domestic first responder. He falls in with a posse of plus ones, men who are married to women whose recognition, income, and fame far eclipse their own. I am kind of cringing while typing this, but I enjoy Hollywood gossip. I consider People Magazine a guilty pleasure, and I constantly amaze my husband with the amount of star trivia that I know. So it's no wonder that PLUS ONE by Christopher Noxon appealed to me. 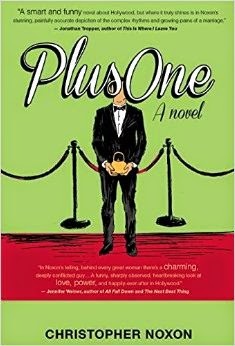 PLUS ONE is a fictionalized account of a man who quits his job to be a stay-at-home dad when his wife hits it big as a television writer and producer. Alex Sherman-Zicklin has a pretty decent life. He's married to Figgy, an aspiring television writer, has two great kids, and a stable (if not entirely rewarding) job as a marketing executive. When his wife Figgy wins an Emmy for her cable series about a housewife who becomes a madam, he decides it would be better for everyone if he just stayed home as the family's "domestic first responder." He becomes a Plus One, a man who is married to a woman whose career accomplishments are far greater than his. As many stay-at-home parents know, Alex's new life isn't exactly easy; and he has lots of adjustments to make. PLUS ONE tells Alex's story (which does tend to resemble the author's real life story) with readers, showing both the ups and the downs, while reinforcing the importance of love and family. I definitely enjoyed PLUS ONE and it's no wonder that Mr. Noxon has received so many impressive blurbs from authors including Tom Perrotta, Jennifer Weiner, and Jonathan Tropper. PLUS ONE has also be optioned by Gaumont International Television, and the TV pilot is in development by The company that did Grey's Anatomy and Ray Donovan. This book was both funny and touching, and I loved getting a glimpse into the glamorous (and often times not-so-glamorous) world of Hollywood. I was only a few pages in when I figured out that Mr. Noxon is married to Jenji Kohan, the creator and producer of Weeds and Orange is the New Black. The descriptions of Alex's wife's first television hit were very similar to Ms. Kohan's real life career. For some reason, realizing this fact gave the story that much more credibility. Don't get me wrong. PLUS ONE is definitely a work of fiction, but it was nice to know that the author could write using many of his life experiences. PLUS ONE was a very entertaining story that also managed to touch my heart. There were so many funny situations that Alex and others faced that I found myself chuckling on more than one occasion. (I won't lie, I loved the descriptions of the woman who starred in Figgy's show and had to wonder how much of her was based on Mary Louise Parker.) In addition, I had no problem seeing why this novel was optioned for a television series. The characters are interesting and many people, like me, would love to watch a show about a family trying to figure things out in the crazy world of Hollywood. One thing I really liked about PLUS ONE was how it focused on families and relationships. While Alex and Figgy's problems weren't exactly typical, their relationship with each other and their kids was definitely relatable. Alex and Figgy were at a crossroads in her life and the struggles they faced weren't that unusual... well some of them! I appreciated seeing how they worked through their issues, and sometimes didn't work through their issues, and how their love for each other and their kids shined through. Like many families, they were just trying to keep their busy lives together and find some sort of happiness and peace! What I think Mr. Noxon did best in PLUS ONE was bring to life Alex's character. He was very likable, despite some of his transgressions, and I rooted for him. As a stay-at-home mom, I know how difficult it can be at times; and I can't imagine being a man and trying to fit in this world. The author definitely made Alex human and his adjustments as husband, father, and a man to being a Plus One seemed genuine to me. One last "cute" aspect of the novel were Mr. Noxon's drawings. At the beginning of each chapter, there was a black and white sketch of an object that had some meaning in the next few pages. He's a pretty talented artist, and I appreciated these extra little fun drawings. I suppose PLUS ONE would make for a fun book club pick. There is definitely a lot to discuss from the lives of the rich and powerful to family dynamics. In addition, you might want to further explore marriage, parenting, identity crises, and love. Overall, PLUS ONE is a smart and entertaining story about what it takes for one man to become his wife's Plus One. I don't keep up with Hollywood gossip because I don't know who anyone is these days. This book sounds cute! I'm usually totally out of it when it comes to Hollywood, but these kinds of books are always fun reads.